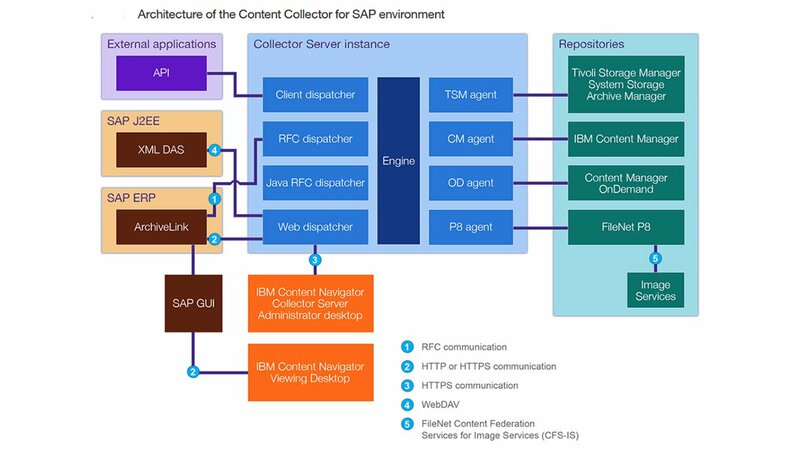 IBM® Content Collector for SAP provides flexible archiving, content management and governance for SAP® data and related content. It extends IBM's value-based archiving capabilities across SAP applications and archive stores, including IBM enterprise content management (ECM) repositories and IBM® Spectrum Protect™. Content Collector for SAP helps reduce total cost of ownership by circumventing costs associated with limited, siloed SAP offerings and by deploying full SAP business solutions that offer expansive capabilities in one unified product. Content Collector for SAP provides capabilities that link valuable ECM-stored documents such as invoices, emails and contracts to SAP transactions. By archiving and decommissioning most non-SAP enterprise applications and enabling consolidation of legacy systems, Content Collector for SAP helps you derive more value from your SAP investment. Advanced archiving methods help to reduce storage and infrastructure costs and improve your ability to meet compliance mandates while enhancing SAP system performance and user efficiency. Consistently archive and collect disparate content types from disparate sources to meet legal, records, compliance, and governance obligations. Provides system security enhancements, monitoring tools and system performance guidelines to enable IBM and IBM-sanctioned third-party Software as a Service (SaaS) cloud deployments.